Hyundai has launched the 2015 Accent sub-compact car with one lone engine available in the range. 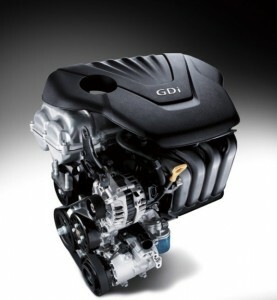 That is the highly-reliable 1.6L four-cylinder GDI unit. It’s a great engine, though, as it was voted one of Ward’s 10 Best back in 2012. The engine is a 4-cylinder, all-aluminum powerplant that delivers 137 horsepower and 123 lb.-ft. of torque. Its fuel efficiency is rated at 27/38 mpg city/highway when it is mated to a 6-speed manual transmission. The GDI technology used in the engine means that the Accent is the first car to employ this in the subcompact category. The system allows for the precise control of fuel injection, which means that fuel economy, power, and emissions are all improved. A number of powertrain innovations have been added to the engine, creating a high level of efficiency in the process. At 86,3 horsepower per liter, the engine has one of the highest hp/L ratings in the segment. The low emissions and 10-year/100,000 mile warranty make the Huyndai Accent an excellent value proposition. There are a few other systems within the vehicle that help promote fuel efficiency. Smooth and efficient power delivery can be delivered via a 6-speed manual or automatic transmission with SHIFTRONIC manual control. Road and air friction is reduced courtesy of low-rolling resistance silica tires. A kicked up trunk edge and tire shielding wheel arches help with the aerodynamic of the vehicles, as does the optimized engine undercover. The engine also features an active ECO system that smooth’s out throttle response by modifying engine and transmission control. Activating this system allows the car to enjoy an increase in fuel economy of up to 7%. The 2015 Accent adds a wide variety of new safety and technology features, but Hyundai has managed this without adding any weight to the car. The low curb weight of the vehicle also helps with the fuel economy, whilst also helping the car be a lot more responsive. That adds up to a great driving experience. Hyundai Accent’s main rivals include Chevrolet Sonic, Ford Fiesta, Honda Fit, Nissan Versa and Mazda2. Here’s the engine comparison chart where you can compare the 1,6L GDI engine specs to those offered by the above-mentioned rivals.